THE MAHOGANY MASQUERADE: The Origin…And Beginning of Steamfunk Cosplay! Carnival is a festive event that typically involves a public celebration or parade, combining elements of a circus, masking and public street party. People commonly dress up in costumes and/or masquerade during the celebrations, which mark an overturning and renewal of daily life. Widely thought to have originated in 12th Century Rome – with its purpose being to play and eat meat before Ash Wednesday, thus marking the beginning of Catholic Lent – Carnival – also known as Jankunu, particularly in the Caribbean and the Southeastern United States – actually has West African roots much older than its Roman influences. Spreading from Italy into Spain, Portugal, England, Germany and France, Carnival – by the 15th and 16th centuries – had become a rowdy tradition, featuring boisterous games and masquerades adopted from a variety of late winter and early spring festive practices. It was a time for ritual and play and by engaging in irony, disguise, laughter, and revelry, people sought renewal and growth for themselves and their communities. The political and industrial revolutions of the 19th century had a significant effect on Carnival celebrations. With newly formed governments perceiving the festivities as civic events, urban street parades became more structured. Groups from different neighborhoods and workers’ guilds competed with one another for the best performances. 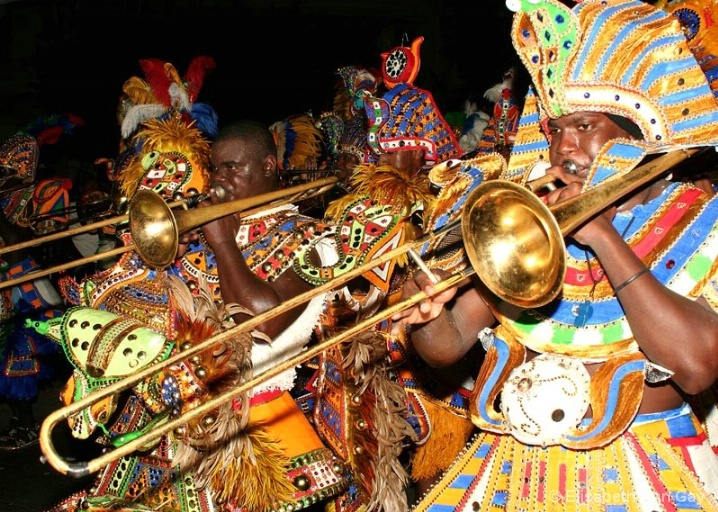 In the Caribbean and Southeastern United States, it is an undisputed African engine that propels this form of cultural expression and the African Carnival, or Jankunu has nothing to do with Lent or Christmas. Every society, however inhibited or repressed, finds occasion for celebration, feasts, festivals, merry-making and the like – it is an aspect of humanity in which we all share. 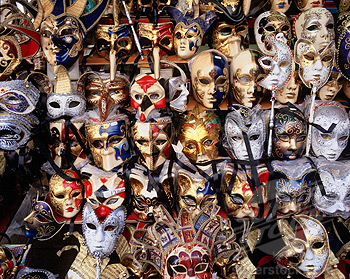 Most societies also have the idea of the masquerade or the costume in one or another form, whether in social or religious ritual, dramatic theater or the stage, or the street parade. Where Africa and Europe appear to diverge in this respect is in the setting of costumed celebrations. French, Portuguese English and Spanish colonialists held costumed balls. Individuals wore costumes and the merry-making was largely indoors, though spill-over onto the streets could be expected. It is the same today with the European Carnivals of Quebec, Venice and elsewhere and is also present also in the celebration of Halloween. By contrast, the African style of celebration called for costumed bands, and for the merry-making focus to be outdoors, rather than indoors, similar to what we see with today’s Caribbean and American Carnivals. 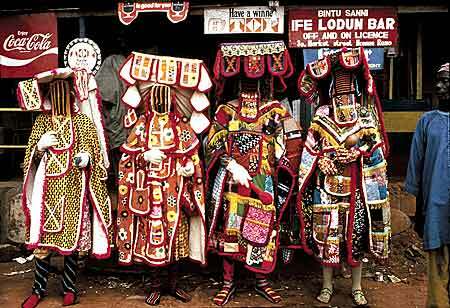 One of the clearest examples of the masquerade in Africa is the Yoruba Egungun Festival. During this festival, every family honors its collective ancestors, and all the members of an extended family lineage wear the same colors, thus constituting a “band”. From the Egungun celebration also comes a feature that we find prominent in various Caribbean carnivals: throwing talcum powder on fellow masqueraders, from which comes the Trinidadian expression – “you can’t play mas’ and ‘fraid powder!”. 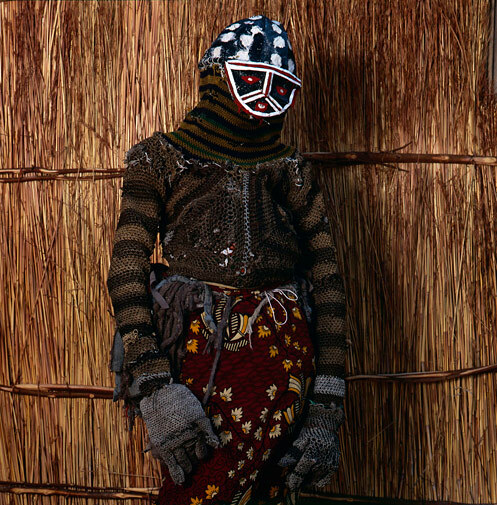 During the Egungun festival people wear masks to show outwardly that they are no longer themselves, that their body has been possessed by an ancestral spirit. The ancestral spirits of the Yoruba are much more than just dead relatives, they play an active role in the daily life of the living. Believed to provide protection and guidance, there are numerous ways the ancestors communicate with the living, one of the most unique is their manifestation on earth in the form of masked spirits known as Egungun. Sounds like what today we would call a Carnival. Even in regard to Herodotus’ description of women pulling up their skirts, thousands of years later, at Carnival, they do the same thing. 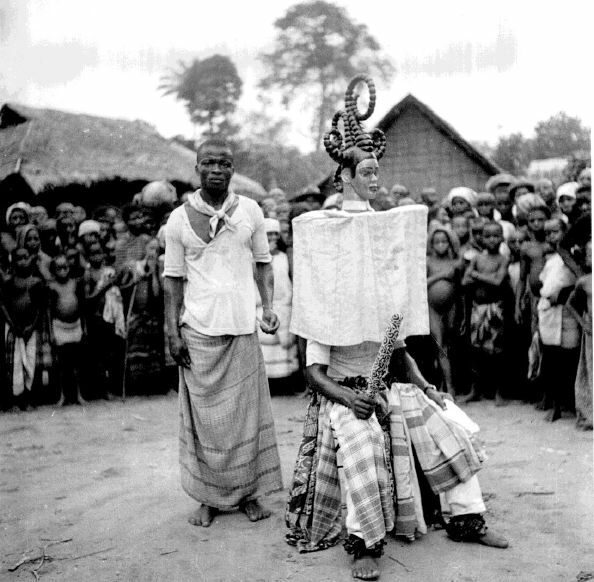 Masking traditions are a major part of the Edo groups of Nigeria, who trace their beginnings to the kingdom of Benin, their neighbors to the south. Basic political units are formed from ritual ties. A council of elders within a number of Masquerade societies forms each small village’s government. Men and women of the Edo people belong to masquerade societies, whose primary responsibilities are to control anti-social forces and help to bring about a better, safer, and well-adjusted community or village. The best-known of the Edo groups, the Okpella, use a widely varying range of mask types, which, according to some African artists, may take up to a year to complete. The masks that are created by the artist convey many different types of rituals and ceremonies. One example of this is a brilliant, white-faced mask representing “dead mothers”, appearing during the annual Olimi festival, which is held at the end of the dry season, and is worn by dancing kinsmen. This festival, as others do, signifies social control and ancestral reverence, celebrating the transitions of age-grades. The Otsa festival embraces women dancers in addition to the male masquerade dancers. During the festival, the women come to the dance area with their masquerade celebration to sprinkle white chalk and water, which symbolizes peace and good luck. This festival annually celebrates the feast of Otsa to purify the land and reinforce community solidarity. In addition to the masks and costumes worn during the masquerades, another vital component is the music and dance used to create the atmosphere that is conducive to capturing the essence of the spirit. The highly sophisticated dance helps expand more of the character being portrayed. Throughout the ceremony, the actions of the dancer may be something entirely different than the person beneath would normally portray. Atmospheric circumstances are another essential element to the success of the masquerade. The right mood and setting add to and enhance the integrity of the performance, inviting the spirits to join. The audience’s participation from the sidelines only adds to the intensity of the masquerade – clapping, singing, and dancing, allowing themselves to feel the spirit’s presence. 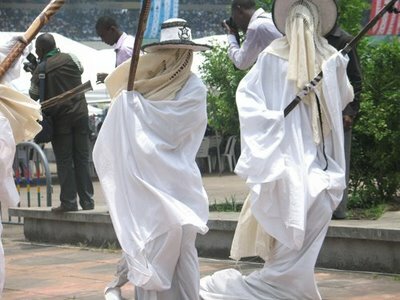 This strong relationship between human and spirits is the grand hallmark of the Northern Edo Masquerades. 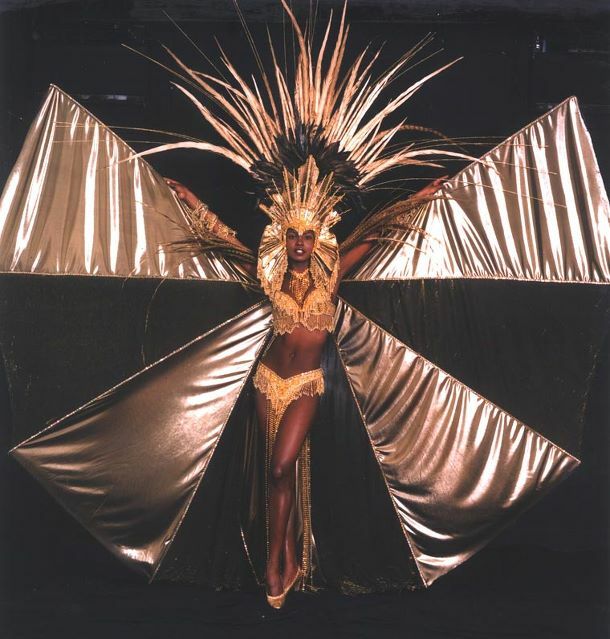 The Caribbean’s Carnivals all have several common themes, many originating from Trinidad and Tobago Carnival which is based on folklore, culture, religion, and tradition. Carnival tradition is based on a number of disciplines including: “Playing Mas”/Masquerade; Calypso Music and crowning a Calypso King or Monarch; Panorama (Steel Band Competition); Jouvert morning; and a number of other traditions. Jankunu (“Junkanoo”) is a street parade with music that occurs in many towns across The Bahamas every Boxing Day (December 26), New Year’s Day and, more recently, in the summer on the island of Grand Bahamas. The largest Jankunu parade happens in Nassau, the capital. In the USA, there are also Jankunu parades in Miami, in June, Key West, in October and Knoxville, Tennessee in June. 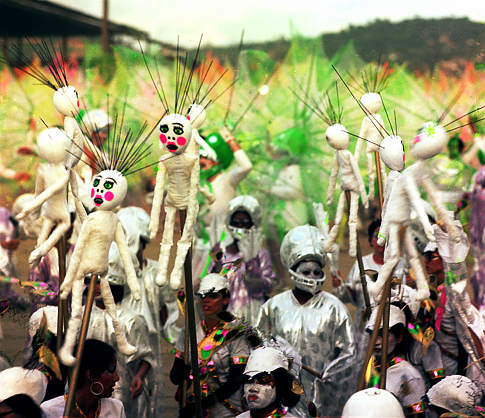 Similar masquerades / street performance traditions, are found on other islands in the Caribbean. On October 26, 2012, we will continue the tradition of the masquerade – and make it even funkier – with The Mahogany Masquerade. The Mahogany Masquerade features Steamfunk cosplay and an evening of Black science fiction and Fantasy short films. 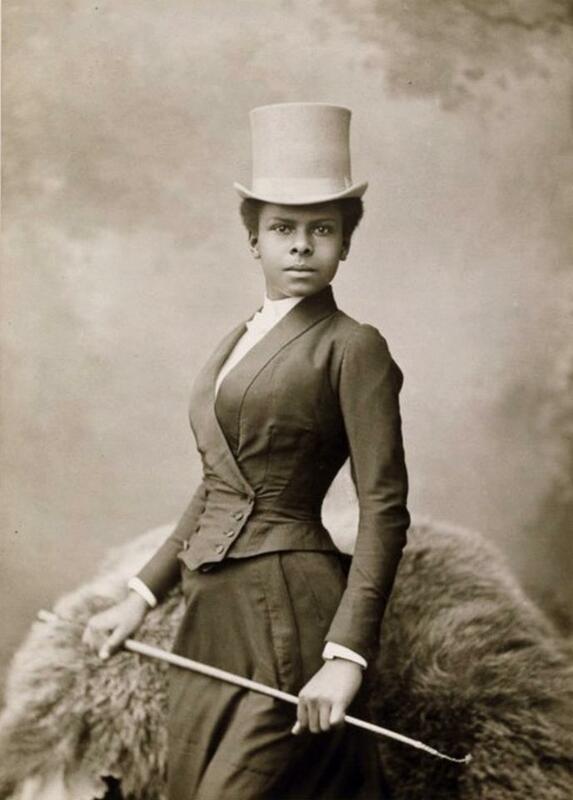 In addition, participants will engage authors, filmmakers and artists in a panel discussion on the Steamfunk Movement; shop for books and movies in the Bazaar and meet and greet their fellow Steamfunks, Steampunks, and lovers of Science Fiction and Fantasy! The event is presented by the Auburn Avenue Research Library on African-American Culture & History and the State of Black Science Fiction as part of “Alien Encounters III”, the four-day convention on Black Science Fiction, Horror and Fantasy! The Mahogany Masquerade runs from 6:30pm – 9:00pm and is FREE and open to the public! Wear your Steampunk / Steamfunk Clothing, Costumes, Gadgets and Gear and receive a free Science Fiction, Fantasy or Horror novel! Please view the video below for ideas and inspiration for your Steamfunk costume and persona. Posted by Balogun on September 23, 2012 in Uncategorized. This is from 2012. Have there been others? Will there be one in 2015 or 2016? Yes, there have been others. We were planning to have a Mahogany Masquerade in October, however, the space we sought may not be available, so it looks like the next one will be in 2016.